I figure I could give an account for an average day for me as a forester. I met a landowner in one of my counties that I wrote a management plan for 10 years ago. The woodland portion of the property is about thirty acres with some ephemeral streams that run through the property. They did a pretty good job in several sections of their property. Afterwards native understory plants like pawpaw, spicebush, and wild ginger began to regrow. Here is a little red oak that probably won't make it due to deer browse as well as not enough sunlinght. Some jewel weed. Good for bug bites and helping to relieve some of the itching from poison ivy. An old open grown chinquapin oak. This tells me the area was probably a pasture +60 years ago, more most likely. Here is an area that had a sewer project go thru. The landowners decided to try and reforest. They planted some seedlings, as well as just seeds, and put tree shelters over top to protect from deer as rabbit browse. After that I headed to park for my lunch and a short hike. Pawpaw is starting to set fruit here in Ohio. One of the biggest spicebush I have seen. And the remnants of a box turtle shell. Just and average day for me for the most part. Thanks, Treez. Looks like a rewarding life. You sure made that look easy. Sign me up. Thanks, treez! I really enjoyed your post. What is the most challenging problem you are called in to handle as a forester? What part of the job do you enjoy most? 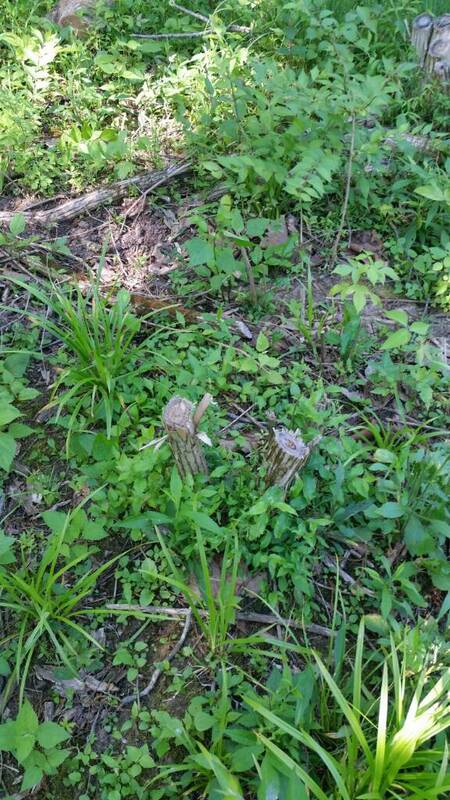 I would say the biggest and most common issue that landowners deal with in my part of the state is invasive plants. Bush honeysuckle being the worst. After that it would be the not so good loggers that give the other loggers a bad rap. There are really good timber buyers out there and some not so good. It is difficult at times when you see a great woods set back decades in terms of getting it back to a healthy state again all do to a poor harvesting job. Typically a diameter limit harvest (all trees worth anything above a certain diameter harvested) marketed as a "select harvest". Yeah select the best and leave the rest is usually what occurs. In terms of what I like the best, being out in the woods and teaching people about their forest. Definitely rewarding! That and coming back to a property 5 or 10 years later and seeing landowners take the advice given to them and applying it. What part of Ohio do you work in? We are in Ashland county and have a small patch of woods that is full of standing dead from emerald ash borer and dutch elm disease, plus a lot of it was used as wooded horse or sheep pasture in the 1980's and has regrown with whatever volunteered. I am in SW Ohio. I work for the State as a Service Forester. Check out OhioDNR.com/forestry I can't recall who covers Ashland Co. but you may want to call the Service Forester there and get some management advice. Treez, I was just wondering about your opinion on trying to save established old ash trees after the invasion of the Emerald Ash borer arrives on the scene? The OMAHA WORLD HERALD had a front page story on the first known Nebraska tree to be under attack in an Omaha park this week. We are about 150 miles from Omaha, but I am also aware that campers from Omaha bring their own campfire wood into Ponca State Park to avoid having to buy a bundle from park headquarters or walking 10 steps back into the timber behind their campsite to gather their own. I don't intend to take measures to stave off the inevitable death of the ash tree on our lot in town because we have hackberry, American linden, ornamental pear, blue spruce and locust trees in place also. I just can't see pouring money into a tree that is eventually going to die anyway, but if you think differently, perhaps I could be convinced to try and save it for a few years. To quote the Roadkill crew, "Best day at work ever!". Seriously, cool pics. Wolfys question about ash trees has me curious as well. The treatments do work. But depending on the treatment it has to be done every year or every couple of years. Typically the older and larger the tree the more difficult it can be get to that product through the whole vascular system of the tree. This is where the emerald ash borer feeds. Also if that tree is under stress, like say from a drougt, the less effective those treatments are going to be. And the tree will have have to be treated for the entirety of it's life. The treatments do not kill all the emerald ash borers in the tree, it simply kills most of them. So they will be able to complete their life cycle, mate, and lay eggs again. So if you stop treatment the tree could and will most likely die from emerald ash borer. Personally I have an ash tree overhanging my house. I treat it, but I treat it knowing that one day I will still probably have to take it down. So if the tree does have some historical or other kind of significance, yeah it maybe worth treating. But just know it may still die. So are ash trees basically doomed here in the states? When the EAB hit around here the city of Lansing cut down all the ash trees on city property. I can understand why. Dying, or dead tree falling causing damage or what not. But at the same time it seems like the EAB is gonna kill these trees. So better cut them down (kill them) before the EAB kills them. Seemed like a strange solution to me. But obviously I'm not a forester or botanist. Ash when it dies gets a lot of secondary insects and diseases. Those secondary diseases mainly break down the wood fibers fairly quick. When that happens you have whole trees that can fall down within a year of dying. Removing the trees once they are dead us much more hazardous. The vibration of the chainsaw can cause big limbs to break. So it is mainly a safety concern. It is safer to cut down a live ash tree than a dead one. I guess I've got some decision-making to do, but I have some time to think about it before they get here. My inclination is to just let the chips fall where they may. I will take it down at the first sign of withering top leaves. The bright side of it is, that it is not in a crucial portion of the yard or in a place where it will damage anything even if I did let it get DEAD dead and fall on something. I do hate losing all of the ash trees in town, though......they are more of them than any other species right now. After the American Elms all succumbed to Dutch Elm disease around here, we decided to plant a variety of native tree species, so if something like that happened again we would not have all of our eggs in one basket. I can't take credit for that move, however......the wise decisions in tree-planting came from my dad. He selected and supervised.....my brother and I dug up and replanted native trees that he selected from those growing along the bluffs that I've shown in my NEBRASKA thread. We planted them at the farm and at both houses in town. Nebraska's J. Sterling Morton created the statewide holiday observance of Arbor Day (now observed nationally) and we planted at least one tree every year around that date. Nebraska was once officially called The Tree Planter State. We planted a LOT of trees for Dad......didn't make my brother and I too happy at the time, but it does now. THANK YOU, DAD! I only have one ash tree in the yard and it seems to be doing quite well so I'll leave it alone. My problem is the approximately 60 dogwoods. They are slowly dying from anthracnose. I doubt there'll be a single one left in 10 years.